Electric bicycles, equipped with small motors, should be considered a vehicle, not a bicycle, Israeli safety officials say. Electric bicycles are the latest fad in Israel. Equipped with small motors, the vehicles can travel about 15 kilometers per hour – and as such, should be considered a vehicle, not a “bicycle,” officials of the Israel Road Safety Agency believe. 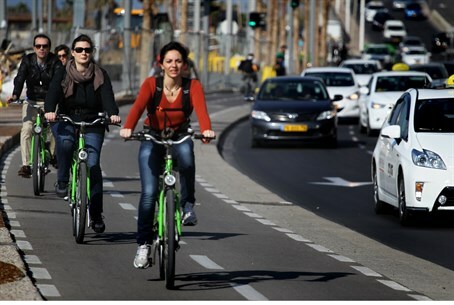 The Knesset is set on Monday to discuss a position paper by the RSA, which seeks to legislate that those who wish to operate the bicycles be at least 14 years of age. The RSA did not supply any statistics on how many accidents take place each year with the bicycles, partly because they are relatively new on the market and have only come into popular use in the past year. However, officials in the government agency cited numerous instances in which injuries – sometimes serious – resulted to both riders and pedestrians caught up in accidents. Currently, there are almost no regulations on who can ride the bicycles, and how powerful they can be. The RSA seeks to change both, with the 14 year old minimum, and by limiting the power of an engine on an electric bike to 250 watts. In addition, riders will not be allowed to use the bikes on streets where the speed limit is greater than 50 kilometers per hours, which will limit use only to local neighborhood streets. And, the bikes will be required to include signs or stripes that will make it easier for drivers and pedestrians to identify them. At this point, the RSA said, it is not seeking a licensing requirement for those who wish to ride the bikes, but that option will be considered if necessary.